On Tuesday 26 October 2010 the Florida Center for Environmental Studies (CES) at Florida Atlantic University (FAU), where I am a Research Affiliate, hosted a Climate Change Research Symposiumto honor the inauguration of Dr. Mary Jane Saunders as FAU’s sixth President. The symposium was held at the Live Oak Pavilion on FAU’s Main Campus in Boca Raton, Florida. The program included various speakers, a panel discussion, remarks from FAU’s new President, and a poster display where 36 posters depicting a vast range of topics related to climate change research were exhibited from 0900 to 1300 EST. I was invited to present a poster showing some aspect of my research work on climate change, in which I have been engaged since 1997, relative to the potential impact of climate change on buildings. 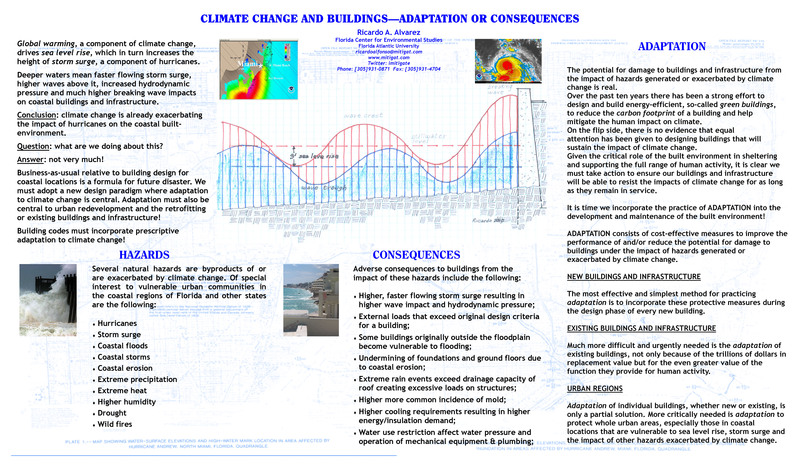 My poster titled Buildings and Climate Change: Adaptation or Consequences is shown above. On this poster I’ve summarized my argument that: (1) Climate change is already generating hazards or exacerbating natural hazards that have the potential to cause damage to buildings in vulnerable locations; (2) Sea level rise is already affecting, and will continue to affect, storm surge generated by hurricanes; (3) Buildings provide shelter for the whole range of human activity, and also protect life and property, consequently it is critically important that we atke measures to allow our buildings to sustain the impact of natural hazards without catastrophic damage; (4) Adaptation, meaning the implementation of mitigation measures, is the best alternative available to reduce the potential for damage to our buildings and infrastructure from the impact of recurring natural hazards during the service life of these structures; (5) Adaptation must be pursued on three distinct fronts: (a) New buildings, where adaptation measures can be incorporated in the design criteria prior to construction, (b) Retrofitting of existing buildings, which at present represent trillions of dollars in replacement cost and even higher amounts in the value of function and services they shelter, (c) Protection of whole urban regions, recognizing that the building by building approach still does not address the vulnerability of whole communities.